Can I use any photo? You should use a professional headshot photograph. The possibility of copyright infringement requires that you warrant you have the right to reproduce any other photograph. If you are not sure you have the right, contact the photographer who took the picture. If you do not have a professionally taken photograph, you may submit a personal photo which portrays you as the center focus in a professional, business appropriate setting. Be sure the photo has good resolution, lighting, and contrast. Avoid photos that are out of focus or hazy, dark, or overly cropped. The RFMall reserves the right to reject orders submitted with unprofessional and/or poor quality photos. Can I get multiple pictures on my cards? No. At this time only one photo can be printed for each card order. If you wish to use multiple pictures, you will need to place multiple orders and complete the check-out process for each. Can I adjust my photo in any way? We have an innovative, interactive tool that enables you to crop and position your photo, within the photo window, as you prefer. When you crop and position your photo, double check to ensure that the photo is positioned and sized as you wish it to appear. Can I supply a disk with the photo or the actual photo I would like to have printed? No. At this time, we cannot accept any photo prints, disks, cartridges or any other electronic media. You may submit your order through our interactive Website only. Will you touch-up my photo? No. We do not touch-up or manipulate the photo in any way. If there are flaws in the original photo they will also show in the reproduction. Be careful to select a high quality photo. Your connection to the internet has failed. Please close your browser, reconnect and try again. The file format is incorrect. The formats allowed for photo products are BMP, JPEG, JPG, TIFF, GIF and PNG. File size is too large or too small. Files must be 15 MB or smaller. Personal firewall software is preventing you from viewing the product preview. What does the file format notice mean? BMP (.bmp) – standard Windows image format on Windows-compatible computers. JPEG (.jpg) – Joint Photographic Experts Group; commonly used to display photo images over the Internet. JPG (.jpg) – the Windows version of JPEG. TIFF (.tif) – Tagged-Image File Format; mainly used for exchanging documents between different applications and different computer platforms. Exact details on which format might work best for your computer's operating system and/or imaging software, please refer to your scanner manual, digital camera manual or your computer operating system manual. What are the requirements for photo size? Photo Width: at least 300 pixels and Photo height: at least 300 pixels. Photo file size cannot exceed 15MB. Pixels are the building blocks for every digital image. Higher pixel amounts in a digital photo signify a higher resolution photo, resulting in better photo business card results. Digital image resolution is the size of your image, measured in pixels. Images that are higher in resolution will result in a better product, while those images with a lower resolution may result in poor print quality and may appear fuzzy and indistinct. Contrast is the difference between the lightest and darkest areas in a scene and/or photograph. Select a design to begin creating a personalized product. First, select an order quantity. Then, enter your name and contact information. Instantly view your design with our live preview. When you have completed the personalization and preview process, select an order quantity, approve and add to your shopping cart. Is it safe to order using this web site? Is my credit card information safe? Our dedicated staff of member service representatives are available to assist you in the ordering process every step of the way. Call one of our representatives at 1-888-271-1885. Operating hours are Monday through Friday 7:00 a.m. to 9:00 p.m. CST, and 8:30 AM to 12:30 PM & 1:00 PM to 5:00 PM. CST Saturday. If you have received your order and it is damaged or defective in any way, please let us know and we will replace it immediately. If you have received your order and feel that the personalization is not accurate to your online preview, we will be glad to re-print your order at no additional charge. For apparel returns or exchanges, please refer to the packing slip included in your order and follow the instructions for returning the item. The packing slip also includes a return address label. Apparel items must be returned in new, unwashed condition before an exchange can be sent. We believe in our products and back them up with our 30 Day, 100% Satisfaction Guarantee. If you are not satisfied with any of our products, call us for a full refund. We apologize, but we are unable to change or cancel an order online. Please call 1-888-271-1885 and speak with a representative for further assistance. Obtain the status of your order by using the Order Status page. You will be asked to provide the Order # and your email address used at the time the order was placed. If you need further assistance to obtain your order status please call us at 1-888-271-1885. Please note that each order item may arrive on separate days. What are 2D Barcodes or Microsoft® Tags? A 2D Barcode is a new kind of bar code, designed specifically to be scanned by a mobile phone. You can print, stick, or display the Barcode almost anywhere. When you scan it with your phone's camera, it automatically opens a webpage, dials a phone number, or takes some other action on the phone. Simply scan a Barcode anywhere you see it - on advertisements, signage, magazine articles, retail shelving, product packages, and storefronts - and gain access to websites, videos, reviews, contact information, social networks, discounts, promotions and more! You just have to download the free Tag Reader on your web enabled camera phone. We have chosen Microsoft® Tag to be our bar coding application because of the strength of their brand and flexibility of their product. Why do I need a 2D Barcode on my business cards? Choose the functionality of your barcode. The barcode can direct your customers to a website you select or automatically save your contact information to your customers' contact address book. Inform and encourage your customers by sharing a website or make saving your contact information fast, easy, and accurate. Does the 2D Barcode replace my paper business cards? Paper business cards are still an invaluable resource as not everyone has a supported phone. Also, if the setting does not allow your customer to scan the Tag immediately (i.e. poor lighting or they're busy) they can take your business card to scan at a later time. Will a 2D Barcode work with any mobile phone? The Microsoft ®Tag Reader is available for most smartphones and many feature phones. It is available on Windows Phone 7, Windows Mobile, iPhone, Android, BlackBerry, Symbian, and J2ME phones. Of course, your phone needs a camera and it must have Internet-access. A detailed list (http://tag.microsoft.com/resources/mobile-support.aspx) of all supported phones is available and new phones will be added over time. Standard rate plans may apply to this and other downloads based on your customers' cellular phone provider and rate plan. How do my customers and I get the reader that scans the 2D Barcodes? There are 3 simple ways to get the Tag Reader. 1. 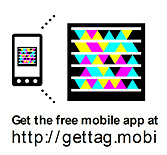 Enter getTag.mobi in the mobile phone's web browser for download instructions. 2. Search "Tag Reader" in the phone's mobile app marketplace. 3. US Residents can text "Tag" to 46676 and receive the download link. In all cases, users are prompted to download the app and accept the Terms and Conditions. If there is a problem downloading the reader, who do I contact? Contact Rodan + Fields at service@brandsupportcenter.com or call 1-888-271-1885. All concerns related to reader or phone functionality will be redirected via e-mail to Microsoft® for resolution. If the reader is free, why is there a fee for the 2D Barcode? There is a $5.00 fee for printing on the back of your card, which is customary in the printing industry. There is no fee for building or storing the Tag with your unique contact information. Will my customers or prospects have to pay a fee to use the reader? The Tag Reader app is available for installation at no cost. However, the Tag Reader uses your data plan, and during the use of the app you may want to dial phone numbers, send emails or SMS messages. Standard carrier rates will apply. How do I specify the information I want to apply to my bar code? We will use the personalization on your business card. It is important to ensure that you use the recommended fields and you preview your order for order accuracy. If my 2D Barcode has an error, who should I contact? The information provided to personalize your business cards is used to build your Tag. Please contact Rodan + Fields at service@brandsupportcenter.com or call 1-888-271-1885 for assistance in correcting personalization or Tag errors. Please note, not all contact information may appear. When provided, your business e-mail and website will always be used for your Tag before alternate e-mail or web addresses. Additionally, incomplete contact information may not be transferred to your Tag. For example, if you do not include a zip code, your address will be excluded. A Rodan + Fields representative will be able to adjust missing or incomplete Tag information. Can I select a 2D Barcode on all my personalized items? Can I get the 2D Barcode on products that are not personalized? The bar code is only available on personalized business card products. Do I have to select the 2D Barcode option for each personalized item? If you are ordering more than one set of business cards, and you wish to have a 2D Barcode on each set, you will need to select the option for each item. The printing fee applies for each item. Can I get more than one 2D Barcode? You can apply one 2D Barcode per paper business card or kit in your order. The regular fee applies for each item. What is the satisfaction guarantee on personalized products with 2D Barcodes? Our standard 30 day satisfaction guarantee applies to all orders. If we incorrectly produce your order, we will issue a replacement and correct your Tag. Contact Rodan + Fields at service@brandsupportcenter.com or call 1-888-271-1885 for assistance.